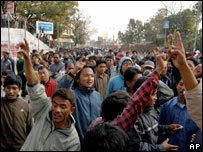 More than 50 people have been hurt in clashes between rival political groups in two southern towns in Nepal. The violence took place on Saturday between established political parties and a group that is campaigning for regional autonomy. Clashes have also broken out in two eastern towns between parties favouring a republic and those wanting to keep the monarchy. The violence comes as democracy struggles to take root in Nepal. Many of those injured on Saturday were members of the youth league of the Maoist former rebels. Reports say they and people from other parties were attacked by the Madhesi People's Rights Forum, which has been demonstrating for the rights of the relatively marginalised southern Nepalese for over two months. On Thursday and Friday it was pro-royalists who came under attack as their small party tried to hold meetings in two eastern towns. Students from the parties in Nepal's ruling coalition teamed up with young Maoists to break up the gatherings, injuring five royalist party leaders in one of the attacks. The royalists were ridiculed, their faces blackened and they were paraded around town with garlands of shoes around their necks. Student leaders were quoted as saying they would not spare anyone trying to save the monarchy. A prominent human rights group in Kathmandu condemned the attacks, saying party activists appeared to have forgotten what it called the people's message of last year's mass rallies that secured the restoration of parliament. The violence shows the still shallow nature of Nepalese democracy. Prime Minister GP Koirala has said that if assembly elections are held by June as scheduled, they will be taking place in abnormal conditions. Although the 10-year civil conflict has ended, there are widespread law and order problems, many of them political.